I really like this birthday card for my great-nephew but I kind of feel that I cheated! It was so simple! To my Pacific Point base card I added layers of Daffodil Delight, Birthday Memories Designer Series Paper and Soft Sky. 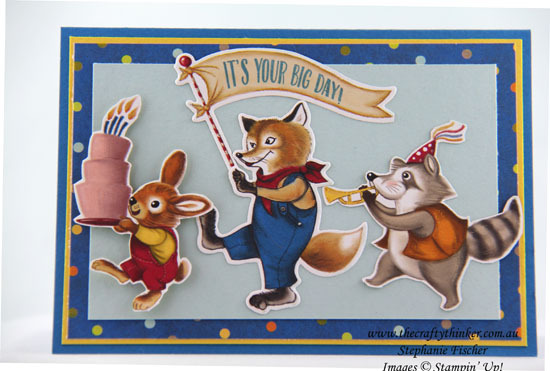 Using the Birthday Memories Designer Series Paper sheet with all the animals, I cut out the fox and the banner with the coordinating dies in the Birthday Friends Framelits set. I then fussy cut the other two animals (not too difficult since they have simplified shapes). 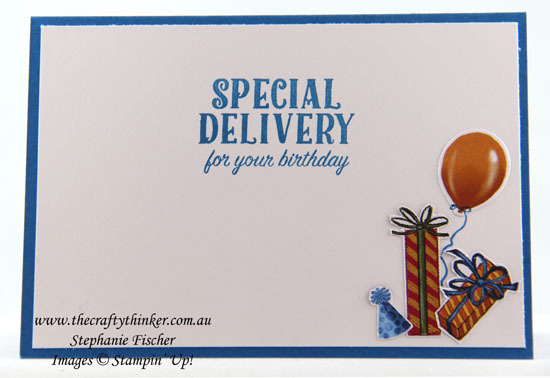 The greeting on the banner is stamped with Pacific Point using the coordinating stamp in the Birthday Delivery set (available as a bundle for a saving of 10%). The rabbit is adhered to the card front with Mini Dimensionals while the other two characters are glued flat to the card. Inside the card, I used Pacific Point ink for the greeting and a Pacific Point Stampin' Write marker for string tied to the balloon. The balloon, hat and gifts are all cut from Birthday Memories Designer Series Paper - there's a coordinating framelit for the balloon and the hat.